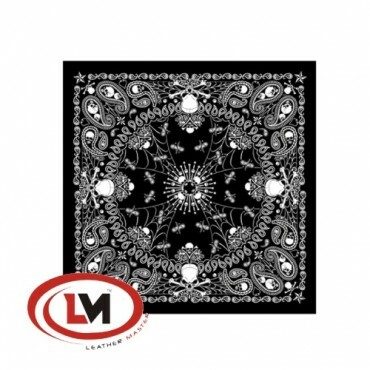 "Assassin Bandana" LM-BAB-1002 Killer Biker Bandana measures 21" x 21" and has two original designs,Allowing for wear in multiple ways. Skulls, skulls and more assassin skulls! Various sizes of skulls on one side,with a similar design on the other in addition to large evil assassin skulls grip smoking handguns right down the middle all in black and w..
"Burning Skull and Eagle Bandana"LM-BAB-1014Burning Eagle Biker Bandana measures 21" X 21".This bandana has two original designs,allowing for wear in multiple ways.Three burning spread eagles on one half, with three burning skull heads on the other half.All separated by an original symmetrical design down the middle.Wear this style on your hear, under your h..
"Celtic Cross Bandana LM-BAB1010 Celtic Cross and Gothic Skulls Bandana measures 21"x21"..
"Tribal Rose Bandana"LM-BAB-1001Tribal Rose Biker Bandana measures 21" x 21" and has two original designs, allowing for wear in multiple ways.An intricate tribal rose design in purple and green on one half, with an identical design in black and white on the other.Wear this style on your head, under your helmet or around your neck to add a little attitude to ..